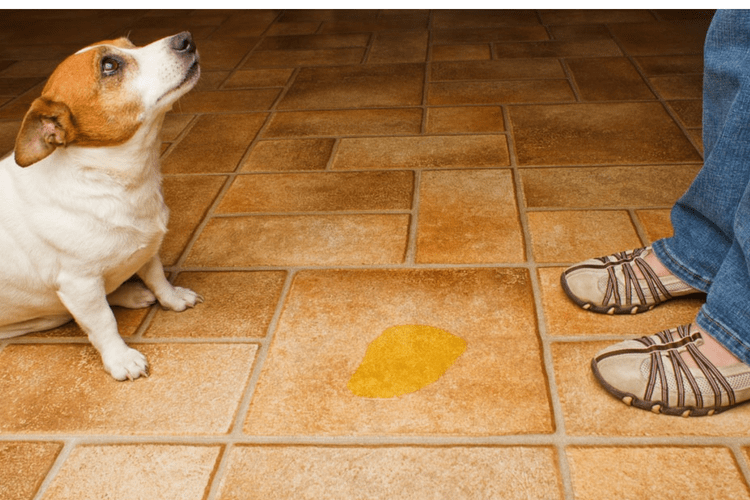 Is your dog making the inside of your house a maze of wet spots and pungent smells? 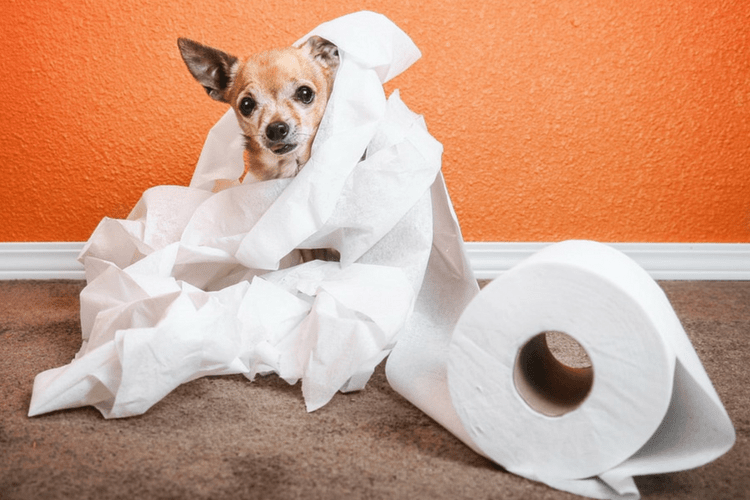 Sometimes even a longtime house-trained dog can regress and begin routinely relieving themselves inside your home, wrecking your carpets and your peace of mind. Experts have identified several triggers for this behavior and also have recommendations for correcting dogs peeing in the house. You don’t have to live with ruined carpets and smelly floors. When your dog reverts to this behavior, it’s in response to some issue. Often, the introduction of a new child or new pet into the home may upset the dog, who begins to have accidents as a result. Strangers, such as workmen, may cause your dog some confusion or distress as well. Even the smell of a new carpet can inspire your dog to mark it and make it familiar. Health problems are often behind this issue. Female dogs can have bladder control issues due to low estrogen levels, especially if they are spayed or older. Some medications can cause this problem as well as serious medical issues like tumors and kidney disease. A trip to the vet can determine if a physical issue is causing the problem. If not, you need to focus on the behavioral issues that can cause a dog to urinate indoors. Training or retraining your dog to relieve themselves outside will require some diligence on your part. Try taking the following steps to alter your pet’s behavior and protect your home and your sanity. Watch for Peeing Signs. Dogs usually have obvious “tells” before they relieve themselves. Watch your dog closely and intervene if you see them sniffing the floor, cocking their leg or even just circling. Get them outside pronto and keep them there until they do the deed. Then, lay on the love and praise. They need to associate outside urination with your approval. Interrupt the Act. This one sounds messy, but if you make a loud noise when you catch them, they may stop peeing inside long enough for you to get them outside. Don’t let them continue or punish them afterwards. Get them outdoors and then praise them for finishing the job there. Remove the Smell. As a dog owner, you know that dogs who urinate in the house will return to the same spots over and over again due to the smell. Their urine contains an enzyme that powerfully marks the spot. Simply cleaning the area won’t get rid of this special scent. Fortunately, you can use a number of homemade concoctions or retail products to eliminate the enzyme. Sometimes spraying your dog with water when they begin peeing in the house will discourage them from this behavior. The water is unpleasant but doesn’t hurt them or browbeat them. The shock should stop their urination long enough to get them outside to finish. Then, of course, you must praise them for going outdoors. Dogs who have been house trained since they were puppies can regress in adulthood. Sometimes, they have physical issues that need to be addressed by a vet. If they get a clean bill of health, you will need to retrain them to go outside. Punishing your dog does not work. Encouragement and praise are effective. You will have to be vigilant, but you can get your dog properly house trained again. Yes. Neuter him. That should help a lot. I have a 9month old male GSD and a 16week male GSD. They get along great. The 16 wk old is potty trained for the most part. The only problem we are having is that when the 2 are playing, he will just stop and pee. This is even if we have taken him out just 5 min before. We have never had this kind of problem in our 30+years of having dogs. Our 9month old is potty trained and only had 1 accident in the house, ever. HELP! I take the 16week out at least 1 hr, while we are home. I work out of my house. He can sleep all night without having to go out as well. He only does this when they are playing. Is this a dominance issue because they are both males? Also, they are brothers from the same parents, just 6 months apart. My dog is 7 and just had bladder test and urine culture. The smell inside is awful on my couch blanket and front hall! He usually scratches at door but when no one around living room…he pees on same part of floor….may have to give him away to someone with fenced yard!! !